SANTA DRIVING THE NORTH POLE EXPRESS TRAIN. A CHRISTMAS CLASSIC - All Aboard!!!! Santa has stoked up the engine of the North Pole. Medley of memorable Christmas tunes. Crafted of a resin and beautifully hand painted. Measures approximately 5.75"H x 10.75"W x 3.25D. Takes 3 "AAA" batteries (not included). 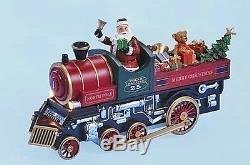 The item "SANTA DRIVING A TRAIN LIGHTED, MUSICAL & ANIMATED CHRISTMAS DECORATION" is in sale since Friday, June 27, 2014. This item is in the category "Collectibles\Holiday & Seasonal\Christmas\ Current (1991-Now)\Figures\Santa". The seller is "kensingtonrowcollection" and is located in Alexandria, Virginia. This item can be shipped to United States.